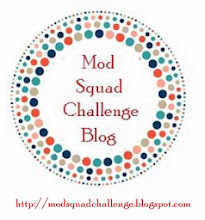 Timeless Tuesday #256 ~ 2014 Pantone Color and Mod Squad Challenge, January 29, 2014 - Are you on the "CASE"? I just learned about these stamps recently and I was able to buy some of them. I have been having so much fun with them, that I decided to enter their new challenge. Inky Paws Challenge #06 - Color Challenge! You are to use the colors, Coral, Golden Yellow, Teal, and lt. Green. I started put with some papers from Echo Park called Paradise Beach. Lovely to think of warm places and colors in this cold Wisconsin Tundra. I use the sweet stamp set (not a pun) called Love a la Carte. I took advantage of the GAMBLERS sale at Flourishes and got 20% off of my order! They are on the way and I should have them soon. I don't know how they get them here so fast, but I love it. The challenge this week for Timeless Tuesday is use Radiant Orchid, or any shade of purple will do. Purple is not a go to color that I use, but hey, this is a challenge. In my card I used the stamp set Garden Picks. Love the bouquets of flowers and the jar for the vase. I was worried that I would not be able to show the water in the jar, but it turned out ok. Here is what I did. First I embossed the image of flowers with clear and heat set it. Then I did the jar the same way. I sponged the panel with Lavender lace ink (SU)and wiped off the excess from the image. I colored the flowers and the water in the jar with Copic markers, and used an oval die to cut it out. There is a white lacey oval behind that. There are panels of DS from GKD on the base and I used foam squares to adhere the image to it. The greeting is from the same set and the ribbon bow above it, as an accent. Thanks for looking, and there is plenty of time to get your project in for this challenge. I have learned so much from this class. Not perfect yet, but getting there. What I am so excited about, is that I can use my cameo to make stencils and I have just found some thin acetate in my stash that will allow me to make permanent stencils. So happy about that. I also learned how to use the paste and now I will probably buy some as well as using my homemade paste. So here are the cards that I made using stencils in various ways. Thanks for looking, this was a lot of fun! Now I can practice to get better. Timeless Tuesday #255 ~ In with the NEW! Something New! I had to think about this one so that I could use the flourish's stamps set that I have. My card expresses the NEW FRIENDS that I have made with stamping. They are all over the world and beyond any expectations. But they are there for me, with the click of my mouse! First I used my Cameo to cut out a stencil and then adhered it to a yellow CS that had swiss dots on it. So much texture. Next I used the Star of Bethlehem flower from that set and colored with copics. The sentiment and the butterfly are from Friendship and Flowers set. So I was able to used my Christmas stamp set in a new way. Yeah! Lastely, I added liquid pears to spots on the sentiment and on the grid on the card. This week, on this brand new challenge, you need to use WOOD. So I went straight away to the EF from Tim Holtz called Wood Grain. But instead of using brown, I experimented with different colors of paper. On this card, I used Ocean Mist from GKD. Then I sponged it with Distressed Inks, Weather Wood and Pumice Stone. I really like how that turned out. That panel is place on a layer of yellow as I knew that I would be putting the Sunflower image as a focal point. The base is Moonlit Fog. From the stamp set Stately Flowers 5, also GKD, I chose the Sunflower and stamped it on a cut out form my Cameo. It is colored with Copic markers and I used foam squares to adhere it. A rhine stone stray and a yellow bow on the bottom. Then I used a typical wood grain onto chipboard and added the sentiment Thanks, with some Glossy Accents. Thanks so much for looking and I do appreciate your comments. There is plenty of time to enter this challenge, as it goes until next Tuesday. So it is cold and snowing in Wisconsin today. Pretty much what it has been doing all winter. Not complaining, just would like a different forecast! Got all of the grandkids valentines cards and gifts mailed off yesterday, and I have completed the birthday cards for this month. That leaves a valentine for my hubby. I had a cute saying that I have kept in my folder for just this occasion. I am using it today on this card. In hope you think it is funny, or at least amusing. It was easy to add glitter to it. I used a die from PTI that I just adore. This one says LOVE. covered that in glitter and used glitter paper too. I did the sentiment on my computer. Here it is. A quick card today. Simon Says A is for Apple. Yeah I know, pretty obvious, but works! Sometimes the Zing is not fully connected and you go with what you get. So on this card, I used GKD stamp set Harvest of Wishes and for the sentiment, A Year of Leaves. The card base is kraft and the image is stamped on white and layered on dark chocolate. I used GKD white ink on the background and dark chocolate ink on the sentiment. Timeless Tuesday #254 ~ Button Up! One more card today, and that will be for the Flourishes challenge #254 - Button Up! I have used this stamp set before, but never this image. On a base of Sand CS I used a die from Majestic Elements cut from DP by GKD. On top of that is a Spellbinder, Lacey circle Die with the tea cup image from Flourishes GRAB A CUP. I colored it with copic markers and used foam squares to adhere it. Next brown ribbon with a button and bakers twine and a few flowers to make it really feminine. Hope you like it. Just let me know, as I truly appreciate the comments. This week was a short week for me at home, as we were gone for 4 days. So, I had a lot of catching up to do. This is my card/project for the Mod Squad challenge, USE SNOW! Well, we have had plenty of that this year. So I thought I could picture how cozy it would be from the inside looking out. I used several stamps and dies to accomplish this. Here is my card. I started with a base of grayish blue and found a matching DP from my stash. I had to make this card bigger than the A2 as my window die is bigger. So this card measures 6 1/2 X 4 1/2. Window die is Grand Madison Window, behind that I used the Swirl EF and sponged with Distress ink, Broken Glass. Then added Flower Soft for the swirling snow. The image is from Newton's Nook, Newton's antics. He is so cute and he is curled up on a rug that I embossed with a Tim Holtz EF. The sentiment is computer generated and placed into a bubble form GKD stamp set, You Say Goodbye and I Say Ello. I little red glitter heart for the love! Lots of texture and foam squares used too. Thanks for stopping by, and please have a very nice day. I am entering this card in the very first Mod Squad challenge. So happy to be playing, and see what everyone else brings to this challenge. Cat has decided that we should use some of her favorite things, and so I have. She listed quite a few and it was easy to put them in my card. I use layering, Copic coloring, dies, and twine. This little snow lady is a digi that I love. I used a black onyx base and layered sand CS over it. The snow is homemade paste, that is working very well for the snow in the background. I cut a doily with my cameo, out of the DP from Love letters, GKD. The red and white heart are spellbinder dies. Let me know what you think of her. I am also entering this card in the Merry Monday #90 Use Ribbon or Twine. A quick post today. The Timeless Tuesday challenge at Flourishes is a shaped card. I used a spellbinder die to cut the base called Majestic Elements using blue CS. A scalloped oval in white layered next with the image form Chrysanthemums stamp set. The image was colored with Copics and sponged with Pumice Stone distress ink. A little sakura pen on the butterfly and three rhinestones on the bottom. Last a double bow in blue gingham ribbon to complete the card. Thanks for looking today. Keep warm, I have to read a book as book club is tonight! Yikes! In keeping with the frigid weather that we are experiencing, I made this card using the cute and adorable Newton Nook stamp. This is Newton and he is so fun to color. I set him in a winter blue setting with the swirls of snow and blue trees and full moon in the back ground. You will be seeing more of him in the future. Today it is so cold outside here in Wisconsin -15, that schools and businesses are closed, and it is a good day to stay inside. So many crafters are having the same weather as here, and I bet they are doing the same thing that I did today. Getting Inky! I had a stamp set that I wanted to use and I am still in the snow/cold/ snowflake mood. JUGS had a sketch challenge that I thought I would enter. I used Cranberry tart CS ( not showing up very well here)for the base and DP from Season's Greeting. the image is so cute and is a Digi that I colored with Copic markers. The other two panels are stamped with Simon Says stamp called Holiday Borders, and I used Warm Cocoa ink. Some matching raffia for a bow and this little girl is just skating by to say "Hi". 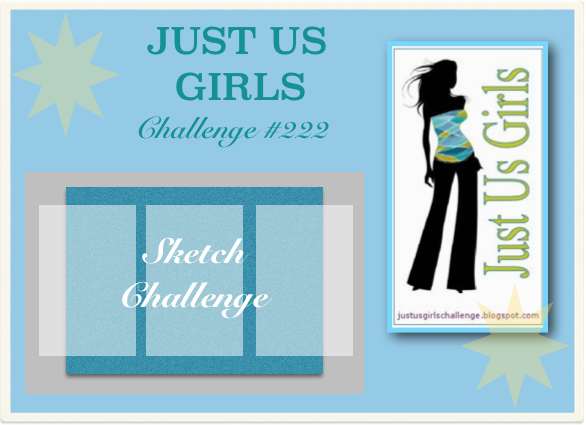 This challenge just started so you have time to enter. Love to see what you have done. This is my first post of 2014, and I am entering the Timeless Tuesday #252 - Shake it Up, over at Flourishes. I decided to just go with the snow theme, as that is what we have been getting ever since the last day in January. I live in Wisconsin you see. It sure looks pretty and there sure is a lot of it. Now, it has stopped snowing, but it is cold, a -9 this morning! We have the promise of some warm weather tomorrow, for just one day. It is supposed to get way up into the 30's. Get your sun hats on! Ok, enough of the cold talk. Here is my card. On a base of Black, I placed a panel of Moonlit fog CS with a window cut in it for a shaker card. Behind the window, is some paper from my stash that has silver dots on it. I put some Flower Soft, in white for the snow, between that and the clear acetate. I colored the image from Flourishes Holiday Topiaries, with Copics and fussy cut it, and then used foam dots to adhere it to the acetate. It looks like the snow is falling behind it. A little embossing on opposite corners and a silver cord tied in a bow on the side and I am almost done. AT this point, it is still looking like a Christmas card, and I am so done with that. What to do? I took the cut out from the front, and used it inside, with a sentiment that I could use for a Valentines Day card. Added some White snow flakes, and now I'm done. Still time to go over to Flourises and make your shaker card, there are some great examples there.